Could DSLRs replace video cameras? Are DSLRs likely to kick out traditional video cameras? DSLRs are in. Photographers and film makers are using them in their practice - and not just small fries either. In 2010, the season finale of the hit US drama House was shot entirely with a Canon 5D Mark II. So why are so many people moving away from dedicated video cameras and using DSLR? "I use DLSR for my video work for a few reasons. Firstly it gives you manual control over the image that no other cameras in its price range really offer (certainly the 550D price range anyway)," says freelance video journalist Adam Westbrook. "You can control the aperture, the shutter speed, focus, ISO and frame size. 'Traditional' cameras that do this cost upwards of £2500. Cheaper camcorders don't offer this control." Westbrook has been shooting professional work on his Canon 550D for the past two years and he's produced some brilliant video as well as becoming an expert in filming in this way. "Recording decent sound straight on to the camera is very difficult. If I had a pound for every time I saw a really well shot DSLR film, but the sound was terrible I'd be a lot better off," he told us, "We use a separate recorder and then sync up the footage afterwards, we use software called PluralEyes that syncs it up by using sound waves, it doesn't always work though." Cameron also notes that while SLRs are a really useful tool for the television and film industry, he can't see it becoming an industry standard. "TV is moving towards more HD content that has to be shot with a camera that captures at 50mb/s and Canon SLRs capture at about 35mb/s. Some super geeks have hacked the Panasonic GH2 camera and have got it capturing at 70mb/s, but you wouldn't see a broadcaster using a hacked camera. "The next wave of cameras that has just come out mix the best features of DSLR's and video camera like the Panasonic AF101, Sony F3 and now the Canon c300 (which captures at 50mb/s)." Cameron's thinking is backed up by a BBC White Paper published just before the public release of the Canon EOS 5D MK II. 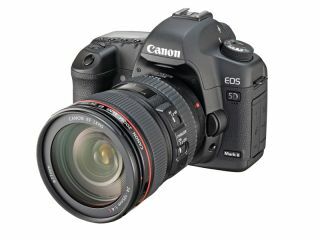 Technicians stopped their testing of the pre-production model of the Canon 5D MK II at a very early stage because it failed aliasing pattern tests and "the results were not encouraging." Adam Westbrook explains, "they don't have manual audio control (without buying an expensive bit of kit) so most users resort to recording their audio separately and syncing it up afterwards which is a pain. Some cameras have issues with something called 'rolling shutter' which can distort the picture in certain situations. Almost every DSLR camera I know has a shooting limit of 12 minutes, which means you have to stop and start your footage regularly." That said, following some of the bugs being worked out, the Beeb has been experimenting more and more with DSLR and compact system cameras like this short report shot on a Sony NEX 5N, as has Al Jazeera... and CNN. It looks like more and more TV and journalism producers are choosing DSLR, with this week's Oscar nominations including a documentary short shot on a 5D Mark II. With the introduction of cameras such as the Canon C300, it'll be interesting to see how traditional video and stills cameras converge - watch this space.